As a pregnant woman hopefully you are feeling excited about the upcoming birth of your baby, but you may also feel nervous, worried or even fearful of childbirth, and may have had a not so positive previous birth experience. We often hear how painful or scary birth is from TV, films and from family and friends, but what if you were told it doesn’t have to be this way? What if you could give birth in a calm, positive and empowering manner. Here are my top 5 reasons how Hypnobirthing can help you achieve just that. Is this really possible? Yes it is! 100% of clients who have been on my course have reported back that they felt calm and relaxed and in control of their birth experience by using the Hypnobirthing techniques taught to them, and no matter what the outcome of birth was. Here is how it works – the ‘fear-tension-pain’ cycle works on the concept that if we can eliminate fear, we will feel more relaxed and experience lower levels of pain. The hypnotherapy element of hypnobirthing tackles these fears with self-hypnosis and positive affirmations. Alongside this, breathing and visualisation techniques are also incorporated so that both the psychological and physical elements of birth are covered. The result is a more calm and relaxing environment in which to birth your baby whatever the outcome and however the birth happens. 2) It helps you to be more informed about your choices, and what is available to you. When a mother and her birth partner can approach childbirth feeling prepared with the right knowledge, information and tools this results in a positive and confident mindset that can lead to the beautiful births that so many women hope for. My Hypnobirthing courses cover many aspects of the birthing process that equips you with the knowledge needed to make informed choices about the options you have when giving birth. I usually get surprised reactions when I talk through this section of the course with many women saying, ‘we didn’t know you could request that’ or ‘we were unaware that that was an option’ – having options and choices creates confidence and empowerment to make the right choice for you. 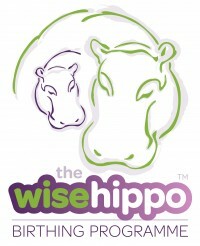 My courses have been devised by The Wise Hippo Birthing Programme and have been created to support mother, baby and birth partners regardless of how and where you give birth. I have had comments from women like ‘there’s no point doing Hypnobirthing because I’m having a planned caesarean’ and ‘Isn’t Hypnobirthing just for home births?” – well the answer to those questions is that the way I teach there is no judgment about where you have decided to give birth, and there is even a course specifically designed for Caesarean births. The techniques you learn and the knowledge you gain will be invaluable to you whatever path your birth takes. One of my favourite reasons for doing Hypnobirthing is that the course isn’t just geared towards the mum it also places a heavy emphasis on the role of your birth partner. I teach a whole section on the birth partners role offering tips on how they can support and nurture you through the birth and beyond. Whether you choose your partner, mum, friend or a doula to be your birth partner, the course will show them how they can support you during pregnancy, how to be your advocate during the birth, and gives them real, tangible things to do in a situation where they can so often feel quite useless. And it creates wonderful memories between you. More and more research is providing independent clinical evidence that a Hypnobirthing approach to birth reduces the need for medical interventions including epidurals and caesareans, less drugs used during labour and shorter hospital stays following birth. Throughout the ages giving birth has been a natural event that woman would celebrate and embrace, and it is only in the relatively recent past that we have started to use increasingly medicalised interventions. The World Health Organisation (WHO) states that only approx. 10-15% of births require a caesarean for genuine medical reasons yet statistics show its currently more than 30% and is continuing to rise. It is time to go back towards more natural methods for supporting childbirth – the act of giving birth isn’t changing, our approach to it is! If you would like to read further about Hypnobirthing you can find details about Polly’s courses and further reading information here. Polly Chadwick specialises in all things Bump, Birth and Baby related including teaching Hypnobirthing and Baby Massage classes, and offering Pregnancy massage, as well as other massage treatments. To make a booking with her visit our Book page. Next article Why have a Sports massage?